Higher costs for oil, industrial metals and other materials have emerged as a headwind during US earnings season, amplifying inflation worries at the same time the labor market is tightening. Companies from across the US economy cited the drag from supply costs in conference calls, in some cases reporting lower first-quarter profits or cutting their outlook. Arconic, a spin-off from Alcoa that focuses on aviation and auto clients, slashed its outlook due to a "steep increase" in aluminum prices, said chief financial officer Ken Giacobbe. 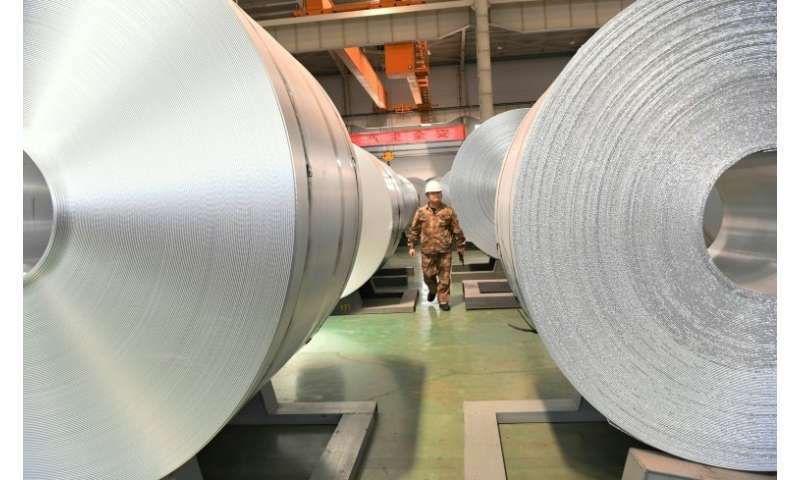 Prices of the metal have risen further after US announcements of tariffs on imported aluminum and sanctions on Russian aluminum company Rusal. American Airlines Chief Executive Doug Parker rued that oil prices had risen "very quickly" and the company cut its forecast range for full-year profits. Executives at Kraft Heinz also reported cost pressures for freight, packaging and oil, although the elevated prices have not affected forecasts, while Mondelez International, another food giant, also confirmed its profit outlook despite higher cocoa costs. Worries about inflation have been a preoccupation of policymakers and money managers all year because of the fear a sudden jump in prices would prompt the Federal Reserve to accelerate interest rate increases, potentially shocking the global economy. The Federal Reserve this week acknowledged that inflation had moved closer to its target of two percent. The statement, while not expressing alarm at pricing trends, kept the central bank on track to keep lifting interest rates this year. Jim Corridore, an analyst at CFRA Research who covers industrial companies, said inflation was "not something we're overly concerned about." Companies managed to turn in solid profits due to higher overall sales and the lift from US tax cuts. "At this point it's not any more concerning than we expected it to be but it's certainly something you have to keep an eye on," Corridore added. Briefing.com analyst Patrick O'Hare said "the risk of a pickup in inflation pressures is building," in part because of rising labor costs. On Friday, the US Labor Department reported that wages increased only modestly in April even as unemployment hit a 17-year low of 3.9 percent. Still economists believe wage inflation could soon pick up, perhaps by a lot. "Ultimately, these companies that are calling out rising input costs have a choice: They can either eat those costs at the expense of their profit margins or they can choose to pass those costs onto their customers," O'Hare said. "If they pass them along, then their customers choose to pass them along to their customers and so on, and so you get more generalized price inflation." Raw material price increases are trending well above expectations at the industrial conglomerate 3M, especially for oil-linked materials and transportation and logistics. But the company expects those trends to be more than offset by strong demand across its markets, including in consumer goods and home care, allowing it to raise prices. "For the year, we're still expecting our stronger price growth to more than offset the raw materials," said chief financial officer Nicholas Gangestad. But companies are also monitoring commodity prices to see if prices continue to rise. A report last month from the World Bank concluded that commodity prices were set to grow "more than expected" in 2018, pointing to increases across oil, metals and grains. In a May 1 investor note, Goldman Sachs also highlighted commodities as being in a "bull tilt" in part because of low inventories after a long period of under-investment. But the report also noted that many investors were "skeptical" of the outlook, in part out of fear of buying at the top of the commodity cycle. Parker of American Airlines said the company's response would partly depend on what happened in the oil market, saying the carrier would lift ticket prices if it concludes high fuel prices are here to stay. "As the cost of production goes up, the cost of the product generally follows," Parker said. If fuel prices stay high, "I would expect you would see higher fares to consumers over time." Ford has estimated that materials costs will be $1.5 billion over last year's, which had already seen a jump. "It will be two years of pretty sharp increases," said Chief Financial Officer Bob Shanks, adding that the estimate did not include tariffs on metals announced by the Trump administration in March. Ford believes the risk of tariffs "has essentially already been priced in by the market," Shanks said.